Volcanoes help define Iceland and hold a special place in the heart of Icelandair since our aircraft are named after famous Iceland volcanoes like Hekla and Katla. Everyone’s so full of Eyjafjallajokul nowadays that poor old Hecla (as we Brits spell it) is all but forgotten, except in my recent post here. It used to be up there in the Volcano Hall of Fame with Etna and Vesuvius, and the Royal Navy has even named seven warships after it, but in recent weeks it has been overshadowed by the overlong (to English tongues) Eyjafjallajokul. If they’d told us it was Hecla, we’d have believed them, wouldn’t we? And we can pronounce that one. But given that their damn volcano threw European travel into chaos for a month and wrecked the London Book Fair, among other sacred events, it’s a bit steep of the Icelanders to name their aeroplanes after volcanoes, nej? I’m not a coffee snob, I’ll drink almost anything, like Stieg Larsson, but there’s no doubt that real coffee made with a decent machine is immeasurably superior to instant coffee. But in a way, I quite like a mug of instant coffee from time to time, as long as everyone (including me) recognises the fact that it is a completely separate drink. There are times when only proper coffee will do. There are times when the real coffee ritual is too protracted and all I want or need is a coffee-related beverage, however distant. Basic instant coffee is too revolting even for me. Kenco Gold is bearable, but you have to use two spoonfuls. You have to use two spoonfuls (spoonsful??) for any instant coffee anyway. 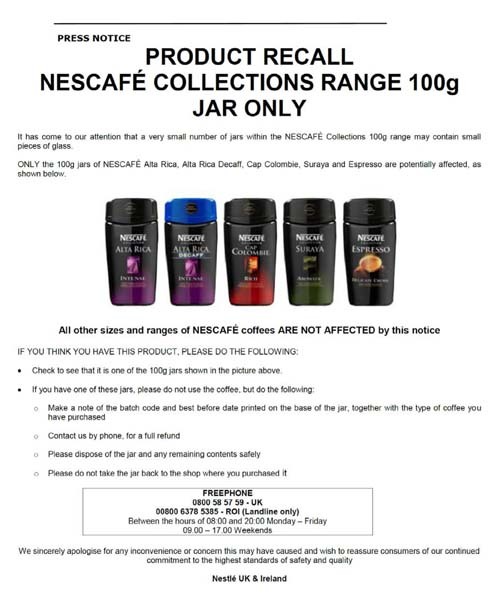 But the other day I saw an exciting range of jars in the supermarket so I thought I’d give them a go — Nescafé Alta Rica, Cap Colombie and Espresso. I was looking forward to trying them out. Could these be the first instants to resemble proper coffee? It looks like I’ll have to wait a while before carrying out the taste comparison test. It also looks like I wasn’t the only punter to be seduced by the cool, sophisticated packaging. I’ve been trying the helpline since 08:30 and it’s permanently engaged. I don’t want to die an agonising death with ground glass lacerating my intestines; I can get that on Holby City. So it’s back to real coffee, made with my trusty Pavoni. I bought it in Lucca, Tuscany in 1983 and I have used it every day since. Admittedly every part except the boiler has had to be replaced, as it was made at the peak of Italian metallurgical brilliance (put your ear close enough and you can listen to it rusting away by itself) but it does make a mean cup of coffee. If I can’t have a proper cup of coffee from a proper copper coffee pot I’ll have a cuppa tea. 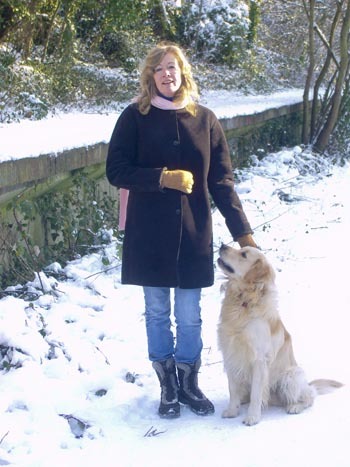 Yesterday’s posting about Bodoni‘s eating and vagrancy prompted the usual rash of font-related comments and questions, including the hoary old one of why we didn’t call Milo the Golden Retriever Baskerville. 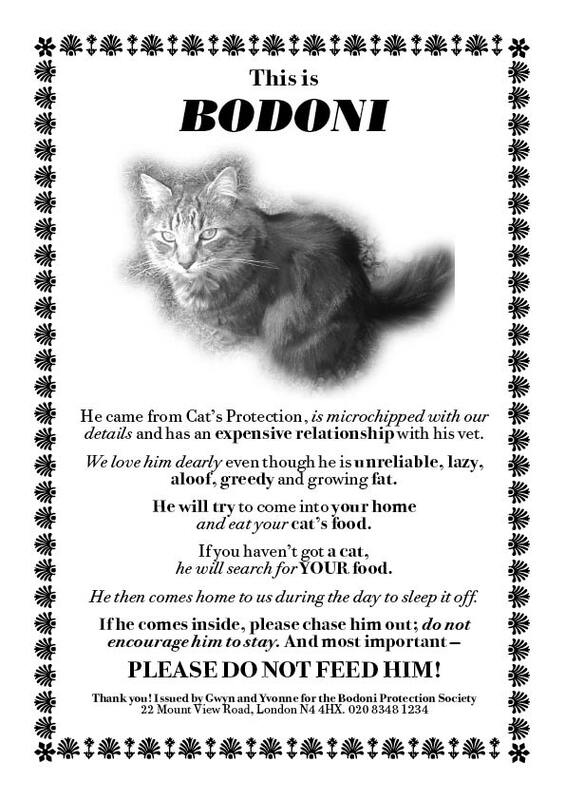 We have two cats named Bembo and Bodoni, and the dog is Milo. Well, the first reason was that three Bs would have confused the animals as well as us, but perhaps more importantly Milo is Von’s dog and she got the naming rights. Milo was chosen after careful checking that the name had absolutely no connection with either fonts or follies. US type designer Mike Abbink appears in my book The Encyclopaedia of Fonts as the designer of Kievit, an elegant Gill Sans inspired Lineal Humanist. 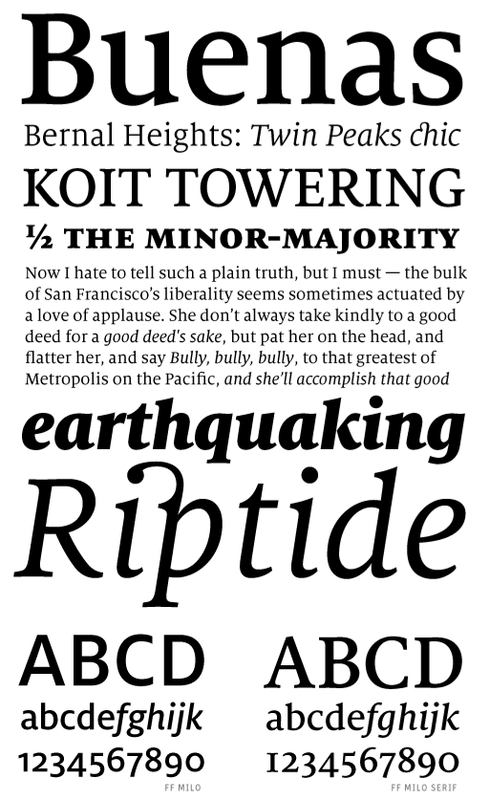 The FF Milo family comes in a staggering 258 weights, and I’d love to know how that’s done. I can’t imagine Mr Abbink sitting down to draw 258 complete suites, but then Kievit has or had 48 weights. 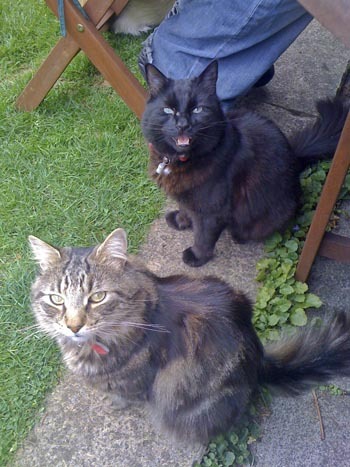 And here’s my own font family — Bodoni and Bembo, an extremely rare photograph of the two of them together as they despise each other and have done from the day we collected them ostensibly as inseparable brothers from the Cat’s Protection League — and Von with Milo at Crouch End station this January. Now it’s May and it’s only slightly colder. Our cat Bodoni is a strange creature. He doesn’t like being loved, hates being stroked or cuddled and considers it rather impertinent of us to be living in his house. But he’s just more catlike than most other cats. However he loves other peoples’ flats and houses, and spends a good deal of his time there hoovering up any food he can find, especially if they have a cat flap. We’re getting a little bored by this behaviour, because we don’t know what he’s likely to have been eating and the vet’s bills are horrendous. Well, he came in for his supper this evening and deigned to take a few bites. Many thanks, Tim and Pinda, but I have seen Bodoni waft through a locked cat flap with one swipe of his mighty paw.